The day I arrived in Vladivostok, I was taken to an open day held by the Russian military. As they searched the bags of visitors at the entrance, my friend Igor warned me to not raise unnecessary suspicion by speaking to the soldiers. I watched hundreds of Russians run the gauntlet through mud and a series of extreme obstacles – presumably designed to showcase the fun that can be had in the military (but resulting in multiple broken bones), and was then let loose with all kinds of guns, artillery, grenade launchers, tanks, and surface-to-air missiles. 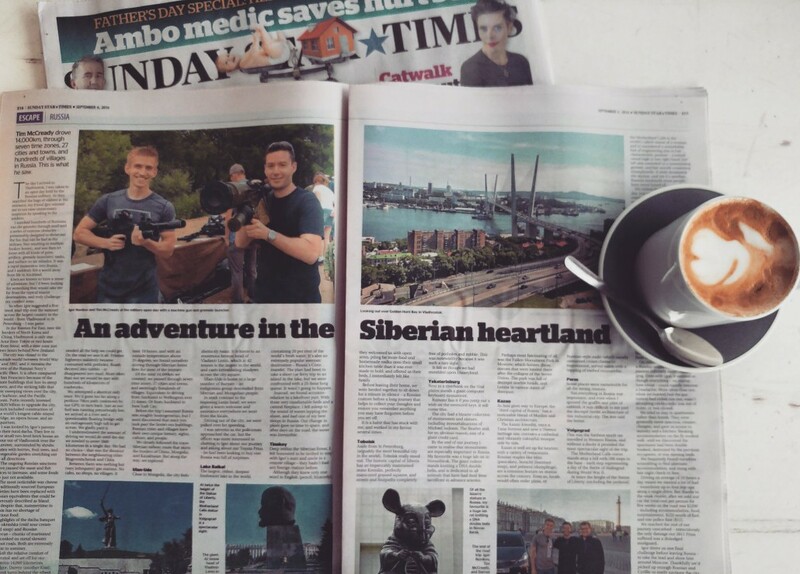 It was a rapid immersion into Russia, and I suddenly felt a world away from life in Auckland. Kiwis are known to have a sense of adventure, but I’d been looking for something that would take me far from the typical tourist destinations, and truly challenge my comfort zone. So when Igor suggested a five week road trip over the summer across the largest country in the world – from Vladivostok to St Petersburg – I was game. In the Russian Far East, near the borders of North Korea and China, Vladivostok is only one hour from Tokyo or two hours from Seoul, with a time zone just two hours behind New Zealand. The city was closed to the outside world between World War II and 1992, and it remains the home of the Russian Navy’s Pacific Fleet. It is often compared to San Francisco because of the ornate buildings that line its steep streets, and the striking hills that offer sweeping views over the city, the harbour, and the Pacific Ocean. Putin recently invested US$20 billion to upgrade the city, which included construction of the world’s longest cable-stayed bridge, an opera house, and an aquarium. I was invited by Igor’s parents to their rural dacha. They live in the small two-level brick house an hour out of Vladivostok over the summer, surrounded by shrubs laden with berries, fruit trees, and a vegetable garden stretching out in all directions. The ongoing Russian sanctions have caused meat and fish prices to increase, and some foods are just not available. The most noticeable was cheese – traditionally sourced European varieties have been replaced with Russian equivalents that could be generously described as bland. But despite that, summertime in Russia has no shortage of delicious food. Highlights of the dacha banquet were okroshka (cold sour cream-based soup) and Russian barbecue – chunks of marinated pork cooked on metal skewers over hot coals. Both are extremely popular in summer. We left the relative comfort of Vladivostok and set off for our destination some 14,000 kilometres away. Igor, Darren (another Kiwi), and I took turns behind the wheel. While one of us slept in the back, one drove, and the other kept an eye out for hazards – we needed all the help we could get. On the road we saw it all. Pristine highways suddenly became consumed with potholes. Roads decayed into rubble – or disappeared into mud. More often than not we would be met with hundreds of kilometres of roadworks. We attempted a shortcut only once. We’d gone too far along a perilous 70km path (unknown by our GPS) to turn back. Just as our fuel was running precariously low, we arrived at a river and a questionable floating bridge with an outrageously high toll to get across. We gladly paid it. I underestimated the amount of driving we would do until the day we needed to cover 1600 kilometres in a single day. We had no choice – that was the distance between the neighbouring cities Blagoveshchensk and Chita. Between them was nothing but (very infrequent) gas stations. No cafes, no shops, no villages. It took 18 hours, and with an outside temperature above 35 degrees, we found ourselves driving through Siberian forest fires for most of the journey. Of the total 14,000km we covered, we passed through seven time zones, 27 cities and towns, and seemingly hundreds of villages. Equivalent to driving from Auckland to Wellington over 21 times. Or from Auckland to New York City. Before the trip I assumed Russia was roughly homogeneous, but I soon discovered that once you look past the Soviet-era buildings, Russian cities and villages have their own unique history, sights, culture, and people. Close to Mongolia, the city feels distinctly Asian. It is home to an enormous bronze head of Vladimir Lenin, which at 42 tonnes is the largest in the world, and casts intimidating shadows across the city square. Ulan-Ude’s population is made up of a relatively large number of Buryats – an indigenous group descended from Siberian and Mongolian people. In stark contrast to the imposing Lenin head, we were given a warm welcome and assistance everywhere we went from the locals. Driving out of the city, we were pulled over for speeding. I was nervous as the policeman approached the car, but the officer was more interested in chatting to Igor about our journey and asking about our Toyota Prius – he had been looking to buy one. Russia was full of surprises. The largest, oldest, deepest freshwater lake in the world, containing 20 per cent of the world’s fresh water. It’s also an extremely popular summer destination – Russia’s Coromandel. The plan had been to take a short car ferry trip to an island in the lake, but we were confronted with a 25-hour long queue. It wasn’t going to happen. Instead, we found accommodation in a lakefront yurt. With three very comfortable beds and a central fireplace, I fell asleep to the sound of waves lapping the shore, and had one of my best sleeps in Russia. Our change in plans gave us time to spare, and after days on the road, the water was irresistible. Deep within the Siberian forest, I felt honoured to be invited to stay with Igor’s aunt and uncle in a remote village – they hadn’t had any foreign visitors before. Although they knew only one word in English (pencil, bizarrely), they welcomed us with open arms, piling far more food and homemade vodka onto their small kitchen table than it was ever made to hold, and offered us their beds. I immediately felt like family. Before leaving their home, we were herded together to sit down for a minute in silence – a Russian custom before a long journey that helps to collect your thoughts and ensure you remember anything you may have forgotten before you set off. It is a habit that has stuck with me, and worked in my favour several times. Aside from St Petersburg, (arguably the most beautiful city in the world), Tobolsk really stood out. The historic capital of Siberia has an impeccably maintained stone Kremlin, perfectly manicured grassed squares, and streets and footpaths completely free of potholes and rubble. This was noteworthy because it was such a rare sight. It felt as though we had stumbled upon Disneyland. Next to a riverbank on the Ural plains stands a giant computer keyboard monument. Rumour has it if you jump out a wish on the oversized keys, it will come true. The city had a bizarre collection of monuments and statues, including immortalisations of Michael Jackson, The Beatles and, for no obvious reason, one of a giant credit card. By the end of our journey I came to realise that monuments are especially important in Russia. My favourite was a huge lab rat in Novosibirsk. The giant rodent stands knitting a DNA double helix, and is dedicated to all animals that have had their lives sacrificed to advance science. Perhaps most fascinating of all was the Fallen Monument Park in Moscow, which houses those statues that were hauled there after the collapse of the Soviet Union. The park was full of decrepit marble heads, and Lenins in various states of disrepair. As Asia gives way to Europe, the “third capital of Russia” has a noticeable blend of Muslim and Christian architecture. The Kazan Kremlin, once a Tatar fortress and now a UNESCO heritage site, contains a cathedral and vibrantly colourful mosque side-by-side. Kazan is well set up for tourists with a variety of restaurants. Russian staples like blini (pancakes), borscht (beetroot soup), and pelmeni (dumplings), are a common feature on menus across the country. Even so, locals would often order pizza, or Russian-style sushi (which usually contained cream cheese or mayonnaise, served warm with a topping of melted mozzarella). Some places were memorable for all the wrong reasons. Not everything in Russia was impressive, and even when I ignored the graffiti and piles of rubbish, it was difficult to see past the decrepit Soviet architecture of this industrial city. The less said the better. This was the furthest south we travelled in Western Russia, and without a doubt it provided the most spectacular sight of the trip. The Motherland Calls statue stands atop a hill with 200 steps to the base – each step representing a day of World War II’s Battle of Stalingrad. At twice the height of the Statue of Liberty (excluding the pedestal) the Motherland Calls is the world’s tallest statue of a woman, and is considered a remarkable feat of engineering due to her characteristic posture – a sword raised high in her right hand, her left arm extended in a summoning gesture, and her mouth screaming triumphantly. It truly dominates the skyline, and yet it’s another Russian landmark most people have never heard of. We visited the statue during the day, but were drawn back in the evening to watch as her profile was lit up under the setting sun. It is probably the most magnificent sight I have ever seen. It was also one of Igor’s highlights. Russians don’t tend to travel far from their own city – Igor told us that without having a couple of Kiwis to travel with, he wasn’t sure he would have ever found the opportunity to visit the historic city he was taught so much about in school. Without a doubt, Russia’s largest cities are the jewels in its crown, with an unmistakable presence of grandeur laced with authority. The familiar tourist sights are more beautiful and majestic than I imagined, but by the time we reached them I realised the privilege of spending weeks visiting sights and attractions devoid of tourists. Suddenly having to queue among hundreds to view Lenin’s body and the Hermitage didn’t feel right. If you are short on time, the Golden Ring (a ring of historic cities including Yaroslavl and Vladimir) is just outside Moscow, and offers an easily accessible taste of the Russian heartland, and a welcome escape from tourists. On reflection, travelling without a Russian would have made the journey infinitely more challenging. Even with Igor, it seemed as though everything – no matter how trivial – could rapidly become a headache. More often than not, when we needed fuel the gas station had either run out, wasn’t accepting credit cards, was out of order, or was closed. We tried to stay in apartments rather than hotels. They were generally more spacious, cleaner, cheaper, and gave us access to laundry and a kitchen. Booking accommodation on the fly worked well, until we discovered the apartment had been double booked, destroyed by the previous occupants, or was missing beds. We frequently found ourselves scrambling to find alternate accommodation, and stung with late night check-in fees. Driving an average of 10 hours a day meant we needed a lot of fuel – sometimes up to four top-ups along a single drive. But thanks to the weak rouble, after we sold our car the total cost per person for five weeks on the road was $2200– including accommodation, food, entertainment, $225 worth of fuel, and one police fine ($12). We reached the end of our journey unscathed – miraculously the only damage our 2011 Prius suffered was a dislodged mudguard. Igor threw down one final challenge before leaving Russia – to take the lead and show him around Moscow. Thankfully we’d picked up enough Russian and Cyrillic to easily navigate the city, and one of the world’s busiest and most extensive metro systems with virtually no English signage. We passed the test.